Notes: Amber, vanilla, orange blossom, woods & jasmine. I've wanted to have this perfume in my collection for the longest time but i've just never got round to purchasing it, choosing to repurchase old favourites and stick to them. I remember the first time i was introduced to the scent, it had just been released and there was a sample in a magazine and i loved it straight away. I didn't realise just how long that was until after doing some research and noticed it first came out in 2005! So 7 years later, i finally own the beauty that is Alien. Being the Sci-fi geek that i am, the box and bottle design to me is simply perfect, capturing the Alien title brilliantly. I also get a bit of a Harry Potter Philosophers stone vibe in there too which is always good if you ask me! I've read a lot of reviews about this perfume over the years and a lot of people say this a day time perfume with the orange and jasmine notes. But despite the floral accents this perfume to me is more of a night time one, i find it to be quite heavy with the wood and amber, i guess it's just personal preference. The lasting power is amazing, in fact it's one of the things it's well known for and gets the highest reviews. A couple of sprays is all you need and hours later it's just a strong. I don't tend to carry perfumes around with me, if i do they're usually sample ones so the fact this lasts so long is really appeals to me. Overall i really love Alien and i can't believe i've waited so long to get my paws on it. I think it's a really unique scent and different to everything i have in my collection and for that reason it gets a big thumbs up! Have you tried this perfume? What do you think? 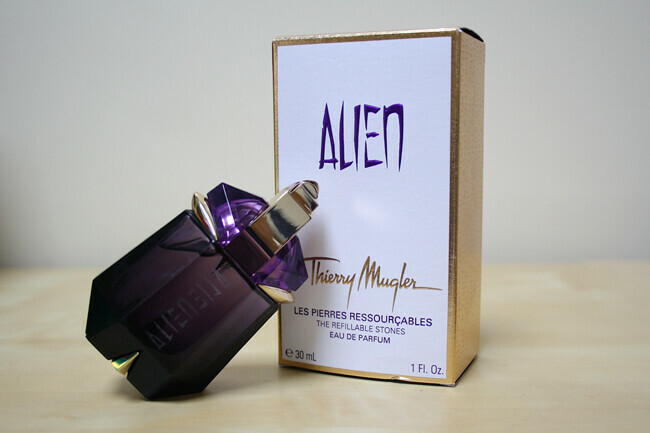 Alien is one of my favorite perfumes! I indeed find it more of a night time perfume too, it's quite heavy despite the floral accents. and I absolutely love the subtle scent of vanilla in it! Wow £18.50 sounds a bargain for a Thierry Mugler perfume! I have this perfume! Well the Eau de Toilette version, which obviously isn't as long lasting, but I find I don't get as much of a 'perfume headache' haha. Definitely agree with you that it's more of a nighttime perfume, its lovely though. I am in LOVE with this perfume. The smell is unique and strong and recognizable! i came across alien a few years ago through a magazine as well and think it's so beautiful! i find as it's quite strong and overpowering that i prefer it as a nighttime scent. must get this again at some point!! This has been my 'go to' night out perfume for about 4 years! I love it! It is such a strong scent and everyone always comments on it!